WASHINGTON, DC - Legendary rock superstar Sir Elton John will receive the Service to America Leadership Award from the NAB Education Foundation June 11 at the ninth annual Service to America Gala. The Leadership Award, NABEF's highest honor, is given to an individual who has performed extraordinary public service in bettering the lives of others. The award is being given to John for his philanthropic work in raising nearly $120 million in the global fight against HIV/AIDS. "Sir Elton John has served as a beacon to the world in the fight against AIDS," said NAB President and CEO David K. Rehr. "The NAB Education Foundation is proud to honor Sir Elton for his extraordinary dedication to eradicating this insidious disease." John cites the April 1990 death of Ryan White, an Indiana teenager who contacted HIV through a blood transfusion and died at the age of 19, as the inspiration for his charitable relief efforts. In 1992, he launched the Elton John AIDS Foundation (EJAF) in the United States, one of the world's leading non-profit organizations supporting innovative HIV/AIDS prevention education and service programs. In 1993 he also founded the EJAF in the United Kingdom. Both organizations help fight prejudice against those living with HIV/AIDS in over 55 countries throughout the world. EJAF US has recently launched new funding initiatives targeting HIV prevention in poor communities in the Southern U.S. and Caribbean, among young people, gay men, injection drug users and people newly released from prison. John also donates time to other philanthropic efforts, including Amnesty International. He performs 30 benefit concerts per year for EJAF and other charities. 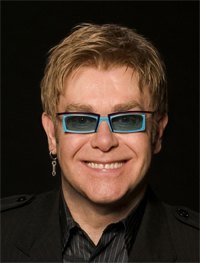 Born Reginald Kenneth Dwight in Middlesex, England in 1947, Elton John burst onto the world music scene with the Top 10 single "Your Song" in 1970. Between 1972 and 1976 he and collaborator Bernie Taupin had a string of hit songs that included "Rocket Man," "Honky Cat," "Crocodile Rock," and "Daniel." He was the most successful pop recording artist in the 1970s, and has continued to record hits in the decades that followed. In 1994, he collaborated with lyricist Tim Rice on the Academy Award-winning Best Original Song "Can You Feel The Love Tonight." Recent recipients of the Service to America Leadership Award include former President Bill Clinton, Her Majesty Queen Noor of Jordan, First Lady Laura Bush, former New York Mayor Rudy Giuliani, boxing legend Muhammad Ali, former President Jimmy Carter and First Lady Rosalyn Carter, and former First Lady Nancy Reagan. The Service to America Awards are sponsored and produced by NABEF with major support from Bonneville International Corporation and the National Association of Broadcasters. Details about the Service to America Awards Gala are available at www.nabef.org. Founded in 1964, Bonneville operates 28 radio stations in the Chicago, San Francisco, Washington, D.C., Phoenix, St. Louis, and Salt Lake City markets, as well as KSL-TV (NBC affiliate) in Salt Lake City. Bonneville's motto is "Do good, do well, make a difference, and have fun." In addition to competing aggressively in major market broadcasting, Bonneville has a nationally recognized tradition of commitment to community. Its three-fold business model is founded on building its people, serving its communities, and achieving aggressive financial goals.